Over the past month, the DA embarked on a countrywide oversight inspection of Public Hospitals and Clinics as part of our #HospitalHealthCheck campaign. Our aim was to assess the real conditions and quality of care at public health facilities. This campaign highlighted a sobering reality that the counrty’s health system is teetering on the brink of total collapse. Public health facilities are no longer places of healing, they have become death-traps for the poor, who have no other options available to them. The Minister of Health, Dr Aaron Motsoaledi, continues to downplay the severity of the countless crises in our public health sector. This is the worst form of denialism, as countless South Africans have lost their lives due to the poor health conditions available to them. The ANC government has failed the poor and vulnerable by subjecting our people to inhumane and degrading healthcare services. It is now clear that neither the Minister nor the ANC government, have the apatite to turn things around. Hospitals and clinics are plagued by long waiting times for patients, this can be directly linked to the chronic staff shortages which have also led to the neglect and even deaths of many patients. All the facilities we visited lacked staff in critical positions. During our inspection of the Bongani Hospital in the Free State, we found that the facility only had one nephrology Sister to attend to patients suffering from kidney diseases. This, despite health Norms and Standards indicating that hospitals should have 9. We also found that there are only 4 porters available to service the whole hospital. While inspecting the Pediatric Ward in Taung District Hospital in North West, the DA found that there was no qualified resident paediatrician to treat children and that the ward is severely understaffed, from nurses, cleaning staff and cooks. 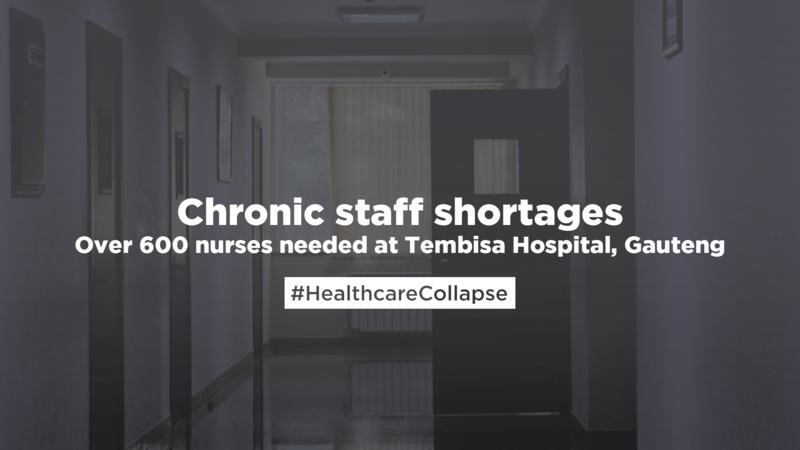 Tembisa Hospital in Gauteng only has 40% of the nurses that are required. According to international Norms and Standards, the hospital should have at least 628 more nurses to provide proper health services to patients. The Soweto-on-Sea Clinic in Port Elizabeth is only visited once a week for four hours by a doctor while the clinic services 3 000 patients per month. This was also mirrored in our visit to KwaZulu-Natal’s (KZN) St Mary’s and RK Khan Hospitals, where KZN’s Health Department has vacancies of 5 926 critical staff. 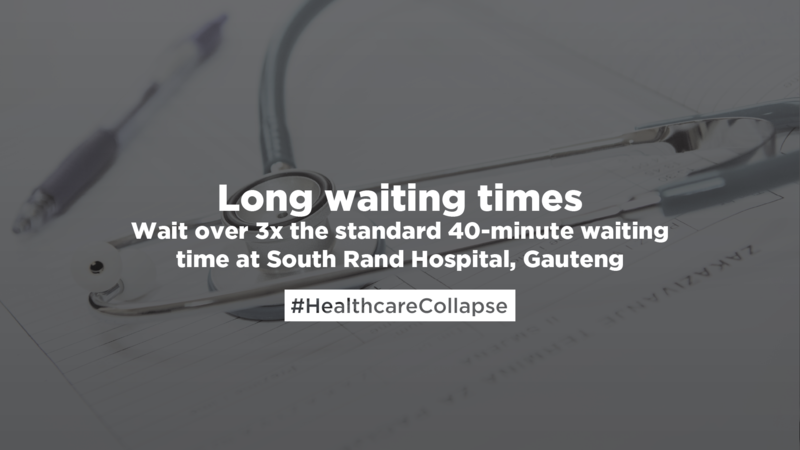 At the South Rand Hospital in Gauteng, the benchmark waiting time for medicines is supposed to be 40 minutes, but most patients said they wait two hours and sometimes much longer. One of the key system failures that have been identified by the DA is the purchasing and maintenance of medical equipment. Medical devices and equipment are essential for the diagnosis and treatment of a wide range of medical conditions. During our inspection of RK Khan Hospital in KZN, the DA found that the X-ray department still has no defibrillator despite us having alerted MEC Sibongiseni Dhlomo in 2014 that it was broken. This is a busy hospital where the need for what is a potentially life-saving piece of equipment is critical. Children at the Pediatric Ward in Taung District Hospital in North West are also at risk of continual infection, as there is currently no isolated ward and basic equipment to control infections. 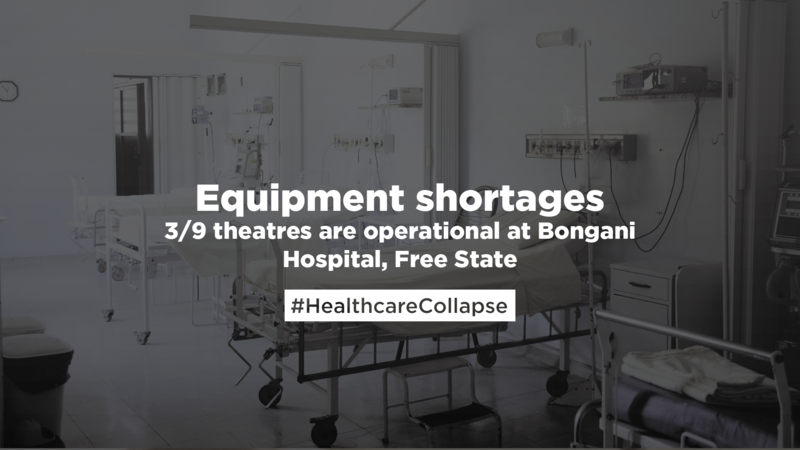 At Bongani Hospital in the Free State, the hospital has 9 theatres but only 3 are operational due to ineffective equipment. The renal plant has not been operational since its inception. The hospital relies on mobile Reverse Osmosis machines, which means they can only assist 8 patients a day. Had they focused on operationalising the renal plant they would have been able to assist 28 patients a day. President Cyril Ramaphosa has promised action with regards to cancer treatment. This promise was not realized as there is not a single radiation oncologist in Limpopo or Mpumalanga. In fact, half the country’s provinces may be relying on just nine radiation oncologists in Gauteng as cancer services in five provinces buckle. In contrast, the Western Cape has 16 cancer specialists in the Public Sector. While inspecting the RK Khan Hospital in KZN, we learned that waiting times for CT scans are as long as three months while the next available mammogram appointment is in 2019. This waiting period has had a huge impact on patient care as only “possible cancers”, those that can be surgically treated or are in early stages given priority. At both hospital and clinic level, there are serious concerns over the lack of availability of medicines, vaccines and consumables. This hampers the efficient functioning of facilities and the safe treatment of patients. While inspecting various Hospitals in Nelspruit and Barberton in Mpumalanga, Emergency Medical Care personnel told the DA that they have resorted to buying vital medical equipment such as high blood pressure machines out of their own pockets due to the department failing to provide such equipment. In the Northern Cape at the Kimberly Hospital, procurement is done at the provincial office, which is out of touch with the actual needs of the hospital. This results in a shortage of basic supplies such as toilet paper and often results in the purchase of inferior supplies, such as surgical gloves. For the past two months at Maphutha Malatji Hospital in Limpopo, the pharmacy has not had an Iron supplement drug, a vital medicine for pregnant women and HIV patients as well as Panado Syrup – a pain-killer for children. While at St Mary’s Hospital in KZN, doctors and nurses complained of shortages of simple and everyday disposables such as syringes, needles and “jelcos” which are used for intravenous access to set up drips. Furthermore, medical negligence claims have led to large payouts which have put a strain on the health budget. Currently, medico-legal claims run in the billions. Last year, the Gauteng Health Department had R18.6 billion in negligence claims, Eastern Cape had R16.7 billion and KZN had over R9.2 billion. In comparison, the Western Cape Department of Health has R135 million in claims lodged against it. 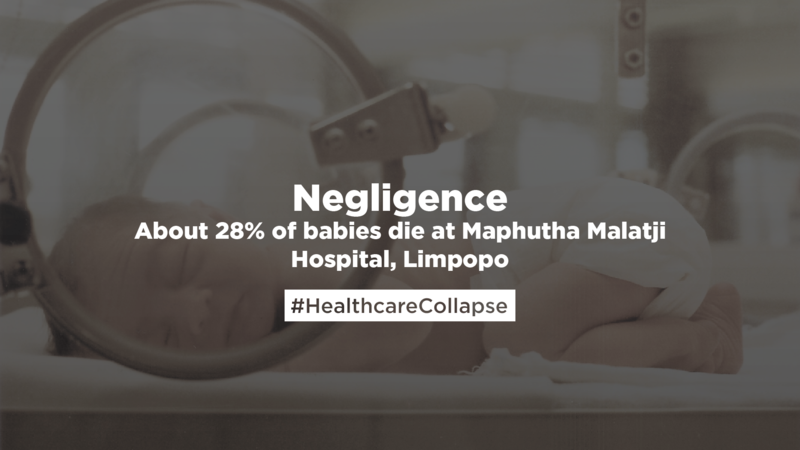 The DA’s oversight inspection to Maphutha Malatji hospital in Limpopo shockingly revealed that of the approximately 230 babies born at this facility every month, an average of 28% (about 64) die. Access to health care is a particular concern given the centrality of poor access in perpetuating poverty and inequality. In one of the hospitals that we inspected in Mpumalanga, we found that the area was allocated 4 ambulances but only 2 are operational. The other two weren’t operational due to mechanical problems. Many of the ambulances had travelled more than four hundred thousand kilometres and posed a risk to patients and medical personnel. The inspection of St Mary’s Hospital revealed that the hospital does not have an onsite laboratory. The result is that patients are often taken into theatre without the necessary blood tests. According to staff, routine blood samples are taken to RK Khan Hospital, some 20 kilometres away, which has its own problems in terms of transport and delays in ensuring that tests are returned on time. Infrastructure is a major concern in the Health sector. The Department’s Annual Report shows that out of the 44 Community Health Centres which were to be constructed and revitalised, only 22 were completed. Out of the 8 hospitals that were supposed to be constructed or revitalised, only 3 were completed. The Department is not reaching more than half of its goals when it comes to infrastructure and this is very worrying, as the vast majority of South Africans have to suffer in inadequate health facilities. 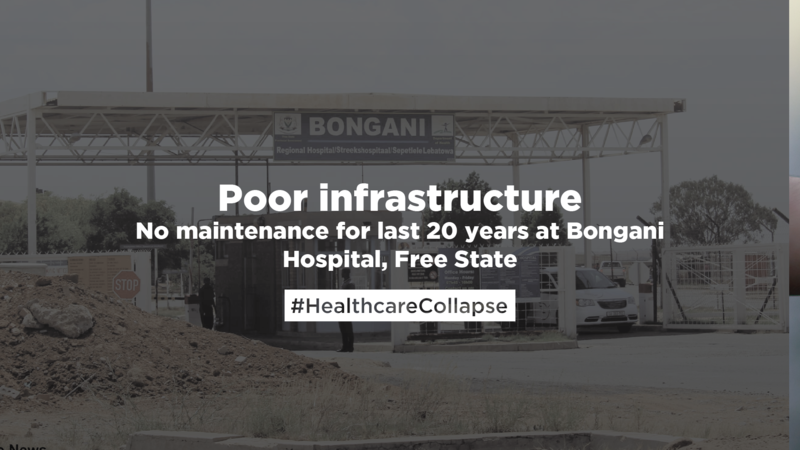 No maintenance has taken place at the Bongani Hospital since it was built 20 years ago. Shockingly at our visit to the Schoemansdal Clinic in Mpumalanga, the toilets haven’t been working for a very long time causing embarrassment to both patients and staff. The pit toilet which is currently being used leaves an unbearable stench which is aggravated by rain. Following the Life Esidemieni tragedy in Gauteng, government is yet again failing to stop future mental health tragedies in South Africa. At Tembisa Hospital, psychiatric patients are kept for long periods of time as there are not enough beds for them at Weskoppies Mental Hospital – they should only be at Tembisa Hospital for 72-hour observation before they are discharged or sent to a longer-term facility. While at Life Esidimeni in Limpopo; rather than increasing their budget to assist with the maintenance of the facility, a decision has been made to halt the funding of the non-profit and for the Limpopo Department of Social Development (DSD) to take over the management and functions of the centre. Given the bad track record of the DSD in Limpopo, its financial constraints and record of mismanagement, every effort must be made to ensure that the mental health centre in Shiluvana remains in the hands of the of Life Esidimeni. The findings from our #HospitalHealthCheck oversight inspection campaign makes it clear that all is not well in our public health sector. Although there are financial constraints facing the Department, it is evident that at the heart of our failing health system is maladministration, poor oversight and the ANC’s disconnect with the vulnerable and sick South Africans. Minister Motsoaledi’s National Health Insurance will not solve the mess that is the public health system. The NHI is not feasible, as seen with the disastrous pilot projects across the country. The DA has launched our plan for universal healthcare in South Africa, which we have titled Our Health Plan (OHP). We believe our offer is the most credible and workable option that seeks to ensure that no person is denied quality healthcare because they are poor. The DA’s mission as a national government-in-waiting is to guarantee universal health care for all South Africans. Works in practice – Many of the aspects of Our Health Plan have successfully been implemented in the Western Cape, and the results speak for themselves. The DA-run Western Cape Province has a track record of delivering better health care than any other province. For example, the maternal mortality rate in South Africa is 153 deaths per 100 000 live births, while the rate for the Western Cape is almost half that, at 84. Our Health Plan is the most practical approach to universal healthcare, as it aims to keep what should be kept, fix what should be fixed, and smartly extend services that should be extended within the limits of the national purse. Hospitals under DA governance will be places where people are cared for and lives saved; not places where people are abused and die. There is a need for a more immediate solution to the health system which will save lives and provide decent services to people of South Africa. The #HospitalHealthCheck oversights have clearly showcased that the National Department of Health and Provincial Departments of Health have failed in their mandate to act and intervention is needed. The Office of Health Standards Compliance (OHSC) is an independent body established in terms of the National Health Amendment Act of 2013 to ensure that both public and private health establishments in South Africa comply with the required health standards. While the OHSC monitors and evaluates health services in the health sector, it lacks the necessary statutory power to act against transgressors. The current Health Ombudsman under the OHSC, can investigate and make recommendations to the CEO of OHSC. If the CEO does not pursue the case the Ombud can elevate the case to the Minister of Health. But as evidenced by the lack of action by the current Minister of Health, the DA proposes that the Health Ombudsman and the Public Protector coordinates to enact recommendations that are truly enforceable and independent. 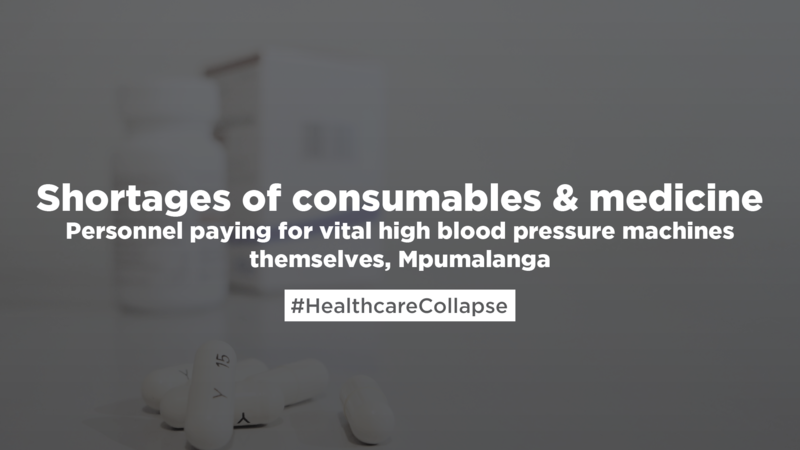 The #HospitalHealthCheck has exposed both the current state of public healthcare in South Africa, as well the ANC’s failure to intervene and perform oversight in the collapsing health care system. Poor, sick South Africans do not have dignified access to healthcare because their government chooses to ignore their plights. We have reported many of these cases to the Health Ombudsman Prof Malegapuru Makgoba, but we believe that the collapse of the health system requires wider and more direct intervention so the full scale of the problem can be uncovered with the mission of finding a lasting an workable solution. We have therefore written to President Cyril Ramaphosa to estbalish a Judicial Commission of Inquiry into the Collapse of South Africa’s Healthcare System. See the letter here. The President is empowered to do so in terms of Section 84(f) of the Constituion. We also wrote to the South African Human Rights Commission (letter here), which oversaw hearings into the KZN Oncology Crisis, the Public Protector (letter here) and the Health Ombudsman (letter here) to throw their weight behind the establishment of a Judicial Commission. The DA has shown through our management of the Western Cape Health Department, our Health Plan and the strengthening of health oversight that better services are possible is in South Africa. A change in government is ultimately the most direct way the people of South Africa can effect change in the heatlhcare system. The DA will continue to expose negligence, inhumane treatment of patients and poor health services in our public healthcare facilities because of our people deserve access to quality health services irrespective of the socio-economic backgrounds.